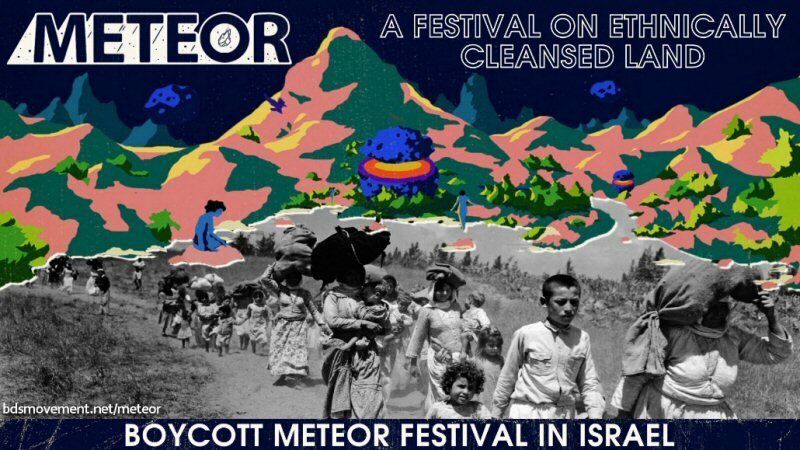 We, Palestinian cultural organizations, municipalities and human rights campaigns, call for the boycott of Meteor Festival in Israel, scheduled for September 6-8, 2018. We urge all participating artists to respect Palestinians’ non-violent resistance and withdraw from this complicit festival as a meaningful contribution to our struggle for freedom, justice and equality. Naranja, the Israeli organisers of Meteor Festival, bring international artists to Israel to serve later as future ambassadors for the country. In 2009, just months after Israel killed over 1,400 Palestinians in Gaza, Naranja worked to “improve Israel’s image in Scandinavia”. Naranja say they want Meteor Festival to create an “alternative reality”. The reality for Palestinians is 70-year-old regime of occupation, colonization and apartheid. Just last week, Israel effectively declared itself as an apartheid state by adopting the “Jewish Nation-State Law”, which constitutionally denies Palestinian citizens equal rights and legalizes their exclusion. The Meteor festival recommends accommodation located in illegal Israeli settlements built in violation of international law in the occupied Syrian Golan Heights. Israel’s expanding illegal settlements steal the land and resources of millions of Palestinians living under military occupation. Israel’s bulldozers demolish Palestinian homes and villages, leaving families and entire communities homeless refugees in our own land. Since 2004, Palestinian artists and cultural organizations have urged their international colleagues not to perform in Israel as long as it continues to violate Palestinian human rights with impunity. Artists played an important role in isolating Apartheid South Africa by refusing to play in Sun City. Today, thousands of artists across the world support the Palestinian boycott call or have respected our nonviolent picket line, including Lorde, Ms Lauryn Hill, Thurston Moore, Shakira, Wolf Alice, Chuck D, Portishead, Brian Eno and Young Fathers. Israel has confined two million Palestinians in Gaza under a cruel siege for over 10 years now. The UN has declared the Gaza Strip as “unlivable.” When tens of thousands of Palestinians in Gaza peacefully protested for their UN-stipulated rights in March, Israeli snipers implemented a “shoot-to-kill-or-maim” and killed over 140 Palestinians and injured over 16,000, leaving many with life-changing injuries. Amnesty International and Human Rights Watch are among the rights organisations who have condemned Israel’s massacre in Gaza. In the area surrounding the festival site are the ruins of dozens of Palestinian cities, towns and villages violently destroyed during the establishment of Israel on the rubbles of Palestine. More than 500 Palestinian population centres were systematically destroyed in this way during the Nakba (“catastrophe”). Many Palestinian communities within Israel are denied basic services, including electricity, water, schools and roads and suffer under a system of racial discrimination that is entrenched with more than 60 racist laws. Against this oppression and dispossession, as all oppressed peoples, we resist. An important part of our resistance is through culture, music, poetry, literature, cinema, dance and theatre. Israel’s response is to detain and arrest Palestinian artists at checkpoints, raid festivals, close Palestinian cinemas and ban Palestinian cultural events. We appeal to artists who are scheduled to perform at Meteor to simply do no harm; to respect Palestinians’ non-violent picket line and to not lend your name to art-washing Israel’s crimes against Palestinians. Stand for freedom, justice and equality. Cancel your participation at Meteor Festival.